Mooney Head Football CMHS Athletic Director Don Bucci and Coach PJ Fecko stand with Seniors Jason Santisi (L) and Cheriff Jamison as they sign their Letters of Intent to play Football with the Youngstown State University Penguins. 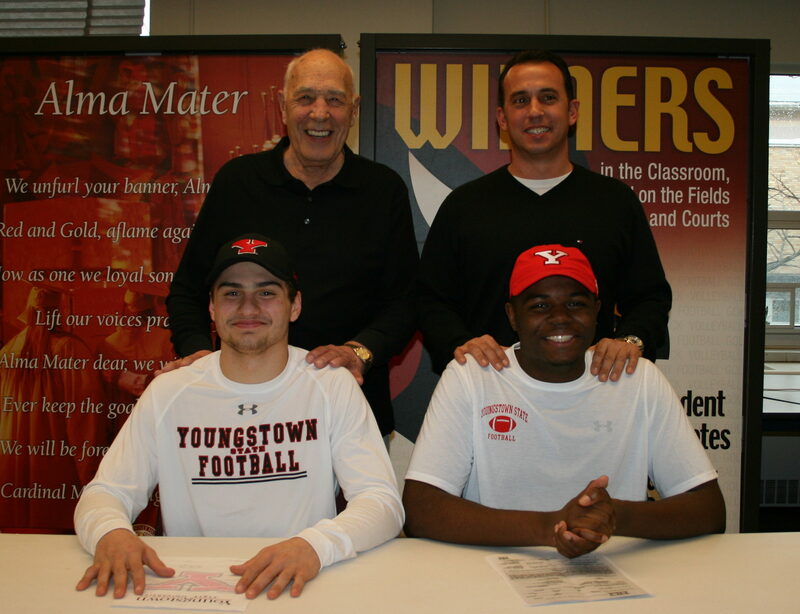 (February 8-Youngstown, OH)-During this week’s National Signing Day, two Cardinal Mooney Cardinal Football players signed their Letters of Intent to play football with the Youngstown State University Penguins. Jason Santisi was offered a preferred walk-on position with the Penguins to play running back. He is the son of Monique and Richard Santisi of Youngstown. Jason hopes to pursue a major in Mechanical Engineering. Cheriff Jamison will be playing defensive end at YSU. He is the son of Cherea Fordham of Youngstown. Cheriff will pursue a major in Business.